Scripps Research scientists have developed a powerful new strategy for synthesizing molecular skeletons of chemicals used in drugs and other important products, a technique that provides unprecedented flexibility and control over chemical synthesis, according to a paper published July 30 in Nature. The method, which combines two chemical reactions used to build molecular rings and link together sections of complex molecules, could speed the discovery of new drugs by offering the ability to simply and efficiently build a wide variety of molecular architectures. It also promises to provide a versatile option for synthesizing natural products from the ground up in the laboratory. The Scripps team, led by Phil Baran, Ph.D., brought together two long-standing ways of constructing molecules, C-C cross coupling and cycloaddition, providing an elegant sequence of chemical reactions that harnessed the benefits of each method. "Chemists have long had to choose between these two stalwart reaction classes, both presenting marked advantages, but also shortcomings," say Baran, holder of the Darlene Shiley Chair in Chemistry at Scripps Research. "Combining these two reactions solves this dichotomy by leveraging the strengths of both to provide a reliable and versatile strategy for producing complex molecules." C-C cross coupling, a bond-forming method that is highly reliable and controllable, has long been the method of choice in the pharmaceutical industry for synthesizing the skeletons of drug candidates. However, the method is limited in its ability to construct complex three-dimensional architectures, resulting in a disproportionate number of flat drug molecules—a characteristic that potentially presents a hurdle to creating new drugs for increasingly difficult biological targets. Cycloaddition reactions, in contrast, offer the ability to build highly complex 3-D shapes in a single step, but different types cycloaddition reactions required highly customized preparation, which limited their utility. The compound epibatidine, a molecule studied as a potential pain medication, is an example of a complex molecule that has been synthesized using cycloaddition. The blood pressure medicine Cozaar, a drug much simpler in shape, was discovered and is manufactured using C-C cross coupling. Baran and his team sought to develop a way to build the skeletons of such molecules in a way that merged the complexity generating ability of cycloaddition with the reliability and versatility of C-C cross coupling. To do this, they solved the conundrum of choosing one reaction over the other by using them together. 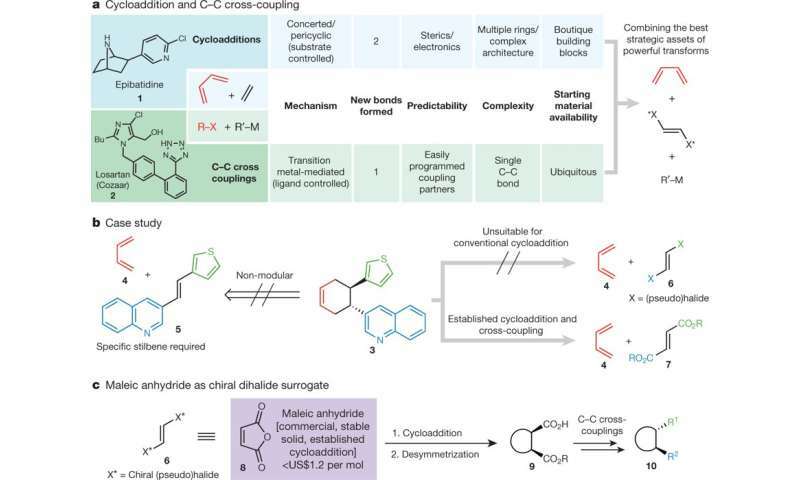 Their new strategy overcomes a number of hurdles to synthesize molecules in a stepwise fashion, beginning by building a molecular scaffold using cycloaddition, setting its 3-D shape and then use of C-C cross coupling to connect other molecular entities to the cycloaddition-built scaffold. The Scripps team reports using their new method to construct more than 80 examples of complex molecules, including natural products (including epibatidine) and compounds currently produced at industrial scale but with different methods. In many cases, the technique offered advantages in terms of fewer steps, greater yield and the ability to produce a wider variety of forms of certain molecules. The researcher was funded by LEO Pharma and the National Institutes of Health (Grant: GM-118176). In addition to the Nature paper, Baran also penned an article providing context to the new technique in Accounts of Chemical Research.